As the “Santa Season” is in full swing it’s time to make and double check your checklist. Certainly you’ve purchased gifts for your family and friends, but what about your bicycle? The holidays are for sharing gifts celebrating the special relationships you have with others. Doesn’t your bike create fun, fitness, and basically, the greatest feeling in the world for you? Show some love to your bike this holiday season. Get it some presents! Your bike’s #1 holiday wish would be to drop the weight – on bike parts that is! You might be wondering where to start, well, since you already feel bad about forgetting your bike on your holiday list, you might as well opt for the best weight reductions you can get for your bike. Consider getting a high quality wheel set. A good wheel set impacts ride quality, ease of pedaling, reliability, and functionality. So, get the best you can afford. Add some new, lighter tires on your wheels and your bike will thank you for the bling! Speaking of bling, your bike’s #2 wish would be to be festive. Light it up! The trick to capturing the benefits is to outfit your bike with a good light system. Whether you are bike commuting, going for a holiday stroll, or getting in base miles, being visible is critical. Here are some tips to getting the right bike parts. You will want lights for the front of your bike. Consider having multiple lights for the front of your bike. One on your helmet so you can shine side roads and traffic and have a second light on your handlebars so you can see at least 10 ft. or more in front of you. For the rear of your bike, opt for a rear red light- particularly one that blinks. A blinking red light is much more likely to get the attention of a passing motorist who might otherwise not notice you. Finally, your bike’s #3 wish is to replace worn bike parts. Your bike wants to start 2018 of fresh! So, don’t wait until you hear odd little noises or cycling accessories fail. Some parts of a bike have a set “wear life”. As you put in the miles, they gradually wear out and need to be replaced. Typically, this includes chains, cassettes, chainrings, brake pads, and cleats. If you plan to ride through the winter months, stay one step ahead of the game by purchasing these types of bike parts on sale and have them on hand when you need them. Go ahead and gift your bike will some holiday presents and your bike will gift you right back with another season of joyful riding. Here’s to sharing the holiday spirit with our two wheeled friend! Happy Holidays! Spotted: Peak Cycles on the Podium! Guess who is rocking the coolest bikes, the best bike parts, and crushing it in Colorado’s toughest mountain bike races? You guessed it – Peak Cycles Racers! 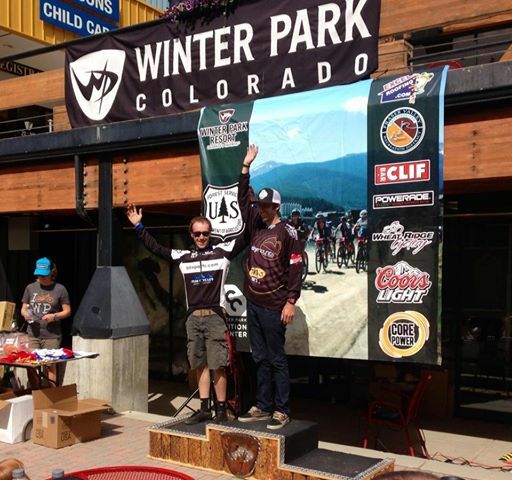 We’re super proud of team riders Joshua Murdock and Weston Burcar who finished 2nd and 3rd respectively in the overall Epic Singletrack Series at Winter Park! The Winter Park Epic Singletrack Series is a 6 series race with varying terrain, distances, and technical challenges. Navigating those challenging races takes skills, talent, and of course, good ‘ole reliable bike parts. Congrats to all of our racers! At BikeParts.com, we do all we can to support our competitive and non completive athletes. And while our racers can tell you, racing takes its toll on themselves as athletes, but also on their bikes. As we’re nearing the end of the XC and endurance mtb racing season, many are shifting their focus to the cyclocross season and to getting in as many good, long rides before we start seeing much cooler temps. Good reminders for any race or ride includes starting your ride with a clean and lubricated chain, well lubed derailleurs, brake pads that are in good shape and tires have the appropriate air pressure. Stop by the Peak Cycles BIcycle shop to pick up any road parts or mtb parts you may need. Don’t forget to high five our racers!